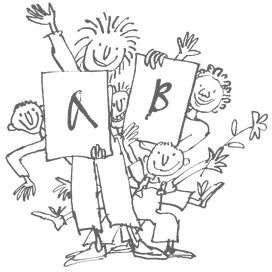 How to apply first graders at the Quentin-Blake-Grundschule! First, on receipt of the letter from the local authorities regarding your child’s admission to school, go to the local primary school in your catchment area at the specified date of registration and ask for a form requesting a place at an alternative primary school. With this application form completed, your own proof of identity (personal identity card, passport or residence registration papers) and your child’s birth certificate, submit the application form to our school within the application period. Please complete the form entirely and clearly. The application form can be found here as a PDF file. If your child currently attends a kindergarten or other day-care centre, we require certification of the child’s attendance there to establish his or her level of language competence. Please note that the application can only be made within the application period stated. The admission criteria for the State Europe Schools of Berlin (SESB) are stipulated in the “Verordnung über die Aufnahme in Schulen besonderer pädagogischer Prägung” (VO-SbP; Regulation on Admission to Schools of a Special Pedagogical Nature). Half of the pupils admitted to each SESB have German as their native language and half of the pupils have native speaker competence in the respective non-German language; both languages carry equal weighting as the languages in which lessons are conducted. Children must have native language competence in one of the two languages of the SESB to which they are applying. If the number of applications exceeds the number of available places, the selection process will be split according to the two language groups at the school. Children who have siblings already at the same SESB. If necessary, lottery process will be used to decide which candidates among equally qualified applicants receive a place at the school. Prior to admission, sufficient competence to meet the admission requirements in both of the school languages is to be demonstrated. The SESB will advise you of the date of the language assessment. You will be informed of the result of the language test directly thereafter.